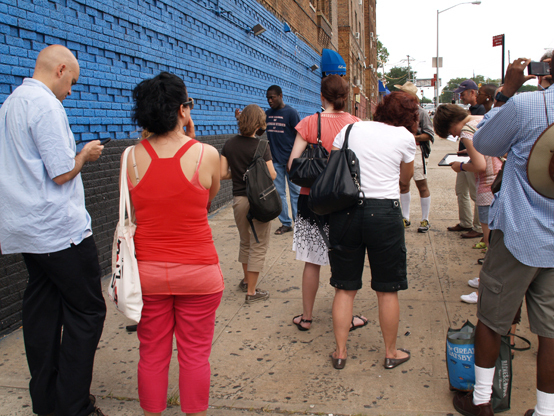 Bronx River Art Center (BRAC) is proud to announce the launch of Virtual/Monumental in public locations across West Farms Square on August 11, 2012 from 11am to 4pm. This project is made possible, in large part, through the support of Deutsche Bank Americas Foundation's Art and Technology Program. This program awarded grants to fifteen NYC organizations to complete initiatives that use emerging technologies to further educational programming, reach new audiences, engage new artists and maximize organizational efficiencies. 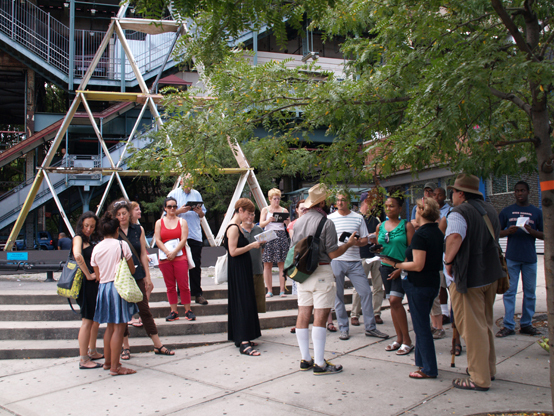 Virtual/Monumental highlights the relationships between site and community through interconnecting BRAC’s Education and Exhibitions programs. The project weaves a visual narrative around the evolving resources and untapped histories of the center, community, and river to overlay historic details with future designs through Augmented Reality and QR codes, experienced on iPads and mobile devices. Through the use of art and technology, we hope to allow citizens to be active in foreseeing their community’s future. BRAC will host a daylong event from our headquarters at 2064 Boston Road on Saturday, August 11, 2012. Visitors will receive maps and information to guide them through projects in nearby parks, gardens, and neighborhood streets. 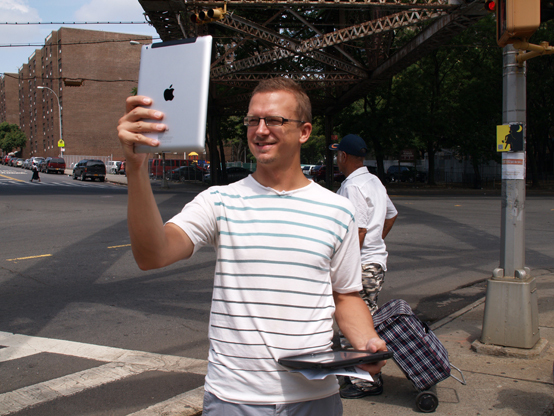 Projects can be viewed independently on a personal smart device or on an iPad provided by BRAC during several scheduled tours led by Gallery Director, Chad Stayrook. Fiction/Non-Fiction by David Abecassis - This virtual installation, located on the grounds of PS 214 at East Tremont Avenue and West Farms Road, consists of two digitized desks with moving text from stories written and drawn by students at PS 214. Future Farms by Katherin McInnis - This project celebrates the culture and future of urban farming in the West Farms neighborhood by drawing attention to current community gardens as well as identifing potential sites for future gardens. A Place to Lay My Head by Maria Mocerino and Nathan Koch - As Old West Farms Soldiers' Cemetery approaches its 200th year anniversary, this project links our past with the present, community and nation, with those who fought since WWI. "Soldiers" will be present on the artist tour to take each viewer an intimate journey, inviting an engagment in a ritual that honors the memory of those who served. Currents of Tremont by Heidi Neilson - BRAC's neighborhood is interlaced by numerous traffic streams: the elevated subway train, roadways, expressways, and the Bronx River. Using video and time-lapse photography, Currents of Tremont captures multiple intersections of these rushing paths, where major arteries of the city cross the river's flow. 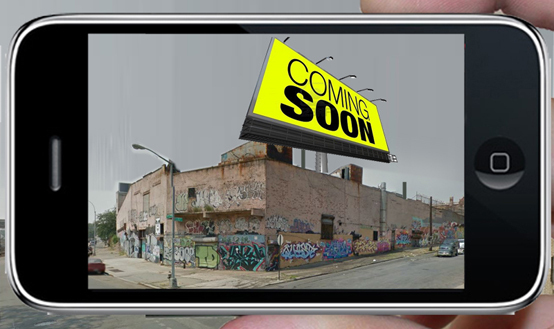 Coming Soon by Stephanie Rothenberg (REV-) - Coming Soon explores the shifting landscape of the West Farms neighborhood through a series of virtual landmarks to create a local narrative on current and future development. As mobile device users walk through the neighborhood, they will encounter a series of animated virtual Coming Soon signs that correlate to a specific physical site. An animated “Welcome to West Farms” sign will be virtually stationed outside the BRAC building to lead the way. 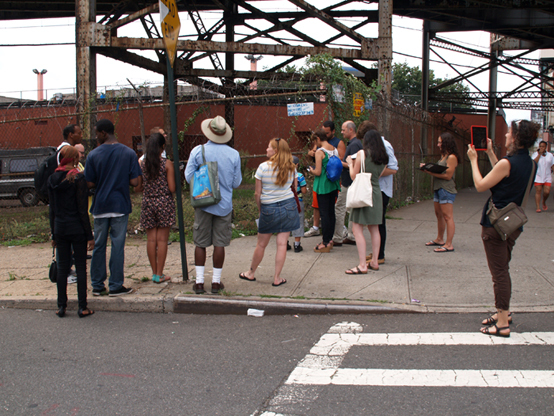 J & West Farms: BRONX by Jason Eisner - For nearly three months, Eisner has been servicing trees and visually documenting the vibrant community life in West Farms Square on his blog as a way of mapping the physical and temporal aspects of the neighborhood. Virtual/Monumental by Teen Project Studio - During BRAC’s Spring and Summer Teen Project Studio, students created their visions of public sculpture across the neighborhood. Projects range from monumental stone sculptures in the Bronx River to painted murals on neglected building walls. Led by Teaching Artists Manual Acevedo and Devon Purkiss. Bronx River Art Center (BRAC) is a culturally diverse, multi-arts, non-profit organization that provides a forum for community, artists, and youth to transform creativity into vision. 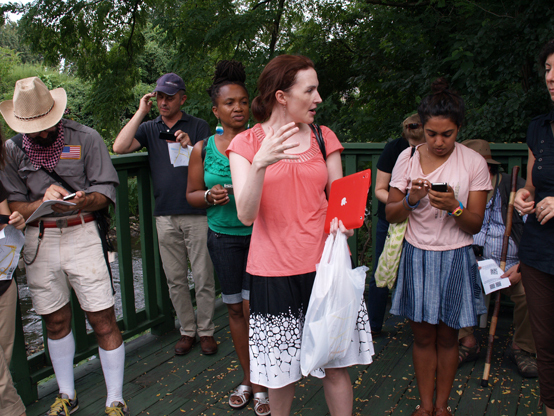 Our Education, Exhibitions, Artist Studios, and Presenting Programs cultivate leadership in an urban environment and stewardship of our natural resource — the Bronx River. Our Exhibitions Program has become known for both its deft curatorial vision and its ability to produce ambitious, energetic exhibitions with ingenuity and immediacy. 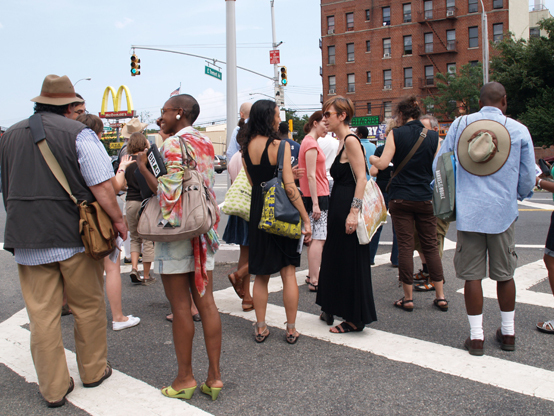 In recent years, we have exposed various paradigms of contemporary art to the litmus test of a local Bronx community and the cultural, economic, and social landscape that defines it. Through initiatives like Virtual/Monumental, we are giving a platform to artists to engage the Bronx specifically in ways that have a lasting and positive impact. This project is made possible with support from the Deutsche Bank Americas Foundation's Art and Technology Program. Additional support is provided by The National Endowment for the Arts, The Andy Warhol Foundation for the Visual Arts, the New York City Department of Cultural Affairs, Consolidated Edison Company, Simón Bolivar Foundation, The New York State Council on the Arts-a state agency, Bronx Borough President Ruben Diaz Jr., Majority Leader Joel Rivera, and the Bronx Delegation of the New York City Council.